Most of my gardening time is spent in the back garden. I spend much less time in my front garden. It's mostly shady due to the trees and tree limbs that hang out over it almost entirely. The plants I've chosen for the front are extremely low-maintenance and easy-peasy to care for. Yet they are arranged in a pleasing fashion. Southside of the front garden from the entrance of the driveway. 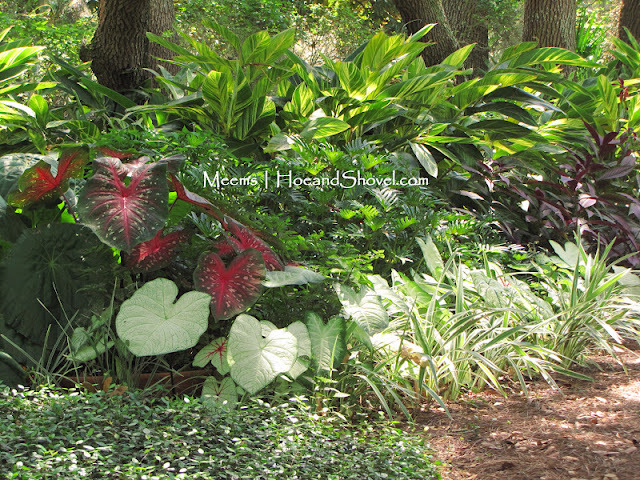 'White Wonder' caladiums in the foreground. 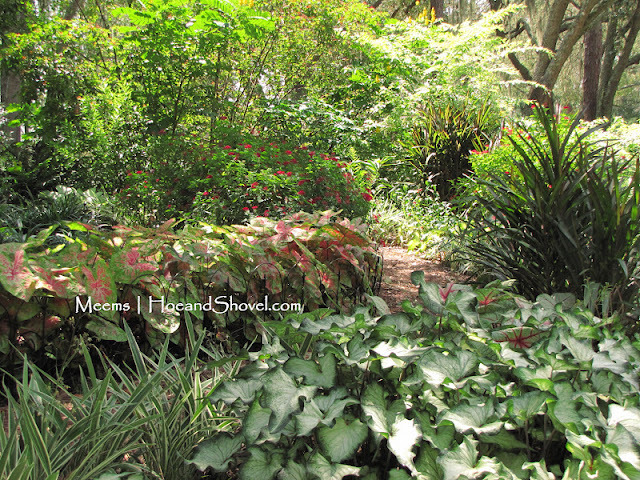 'Raspberry Moon' caladiums in the middle. Since I removed all the grass and planted the front garden with alternative ground covers, it is actually easier to maintain. Did you know a plant doesn't have to be low-lying to be considered a ground cover? All the plants you see in this photo can be used to replace the lawn. Another view of the front garden next to the street. These plants require less water, less fertilizer, and less attention than a lawn. I rely on nature to eliminate any pests I might have. Honestly, I haven't had any pest problems I needed to address in a couple of years. Nature balances nature. Predator bugs know how to get rid of harmful bugs. It is so much more advantageous to feed the soil with amendments than to worry about fertilizer. Healthy plants don't need fertilizer. The front garden has a slight slope toward the street. 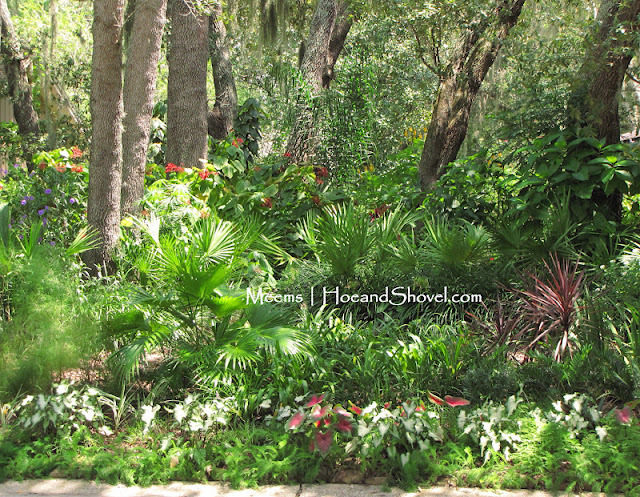 A blend of Florida-Friendly plants mixed with Florida natives makes this part of the garden super-easy to sustain. To find out more read my Lowe's Creative Ideas Regional Gardening article which includes 3 Easy Steps to Make Your Front Yard More Inviting (click here). ***Don't forget to visit Hoe and Shovel on Facebook and LIKE us to join in the discussions. We post photos there (almost) daily and would love to hear from you! I love your front gardens. Very colorful, different textures and shapes, and a nice shady welcoming area to your home. I so agree that nature knows how to keep the balance. After all, it's been doing it for years without our interference! Lovely shade you have, Meems. Thank you for always being an inspiration. Authentic Provence will awaken all your senses with its most complete and genuine collection of the most distinctive French garden antiques and home décor the Mediterranean has to offer, carefully chosen by its owner a appassionato European art historian. So glad you made the point that groundcovers don't have to be short little grassy plants! 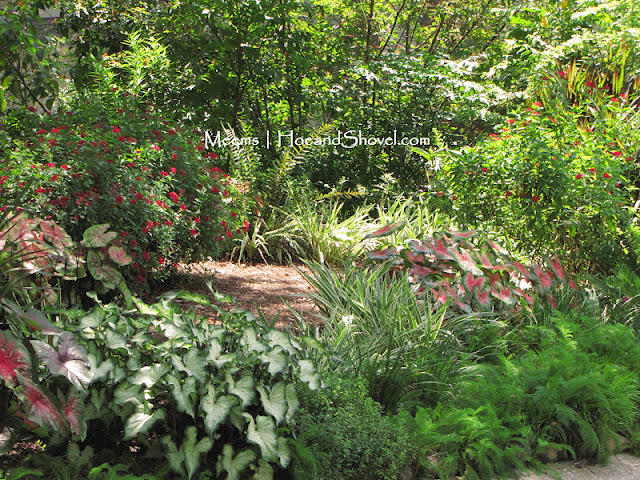 I use liriope, African iris and muhly grass as groundcovers, among other plants. 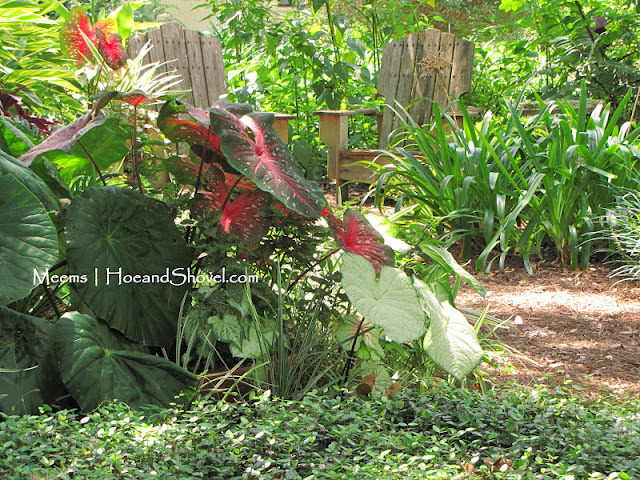 Your caladiums sure are hanging in there -- mine have already started pooping out! Are these the caladiums you planted late in the summer, by chance? Meems, I purchased a lovely dwarf firebush recently at Lowe's (they call it "Dwarf Hummingbird Bush" . It is a perfect groundcover, growing to about 2' x 2'. I like it so much I may go back and buy 2 more so I have a trio planted together! Your caladiums are awesome!!! Nice combo choices. I definitely love the plants you choose. They have this tropical look which I really like. Love it! This area looks like it was created by Mother Nature herself. Great job and I know if I drove by I would enjoy the scenery. Inspirational pictures! I just bought my first Shampoo Ginger and a red/green bromeliad (don't know what variety) after seeing all your lovely (and other Central FL blogs) photos of this kind of gardening/landscaping.